The US dollar recorded a rise against the Japanese yen on Tuesday. The session started at 111.08 and the dollar added 80 pips. Daytime extreme values ​​were reached at 110.82 and 111.95, respectively. The four-hour chart suggests an increased interest of the bulls to the couple, with a more significant goal of 114.00. After the FED news yesterday USD/JPY returned to the support at 111.00 and is once again range-bound above that level. I think it’s possible to see another move to the upside to 112.20. The US dollar recorded a decline against the Japanese yen on Wednesday. The session started at 111.88 and finished 72 pips lower. Daytime extreme values ​​were reached at 112.18 and 111.05 respectively. If the bearish trend persists, the pair will most likely test the first support at 111.00. Usd/Jpy is bouncing on the downside between 111.70 to 110.60, support lies around 110.60/70 zone, break below would open the door to 110.00. USD/JPY is still undecided above 111.00. I have closed all my positions and I will wait out the end of the range, which I think won’t occur before the beginning of next week, before opening new ones. The US dollar recorded a modest rise against the Japanese yen on Thursday. The currency pair opened at 111.16 and the price bounced back from 111.00. Eventually, the pair finished at 111.22 and if the bearish trend kept the most likely the dollar would be able to break the support at 111.00. After North Korea tested another missile that landed in Japan’s exclusive economic zone, Yen continue to push lower, 110.00 become critical support. USD/JPY is range-bound around 110.50 and so far appears very undecided. I think we’ll have to wait for the news later this week and especially the NFP for USD/JPY to pick a more clear direction. I think USD/JPY may rebound from 110.00 since it has formed a bullish inverted hammer bar on the H4 time frame at that level. Next target is around 110.50 - 110.70, in my opinion. The USDJPY reaches the 76.4% Fibo around the 110.14 level as shown on the daily chart. The pair may try to bounce to the upside from that zone and maybe reach the 50% Fibo zone where we can also find the 200 day EMA (blue line) at the 111.66 level. A breakdown of the 76.4% Fibo could take the USDJPY to the low at the 108.80 level. As I thought it would, USD/JPY rebounded from 110.00 and not only reached 110.70 but it almost reached 111.00. I think that if the rally continues today we’ll see it reach 111.50. For the moment I don’t have any new positions as I don’t think there will be any major changes before the US Non-Farm Payrolls tomorrow. I think range will continue until then. 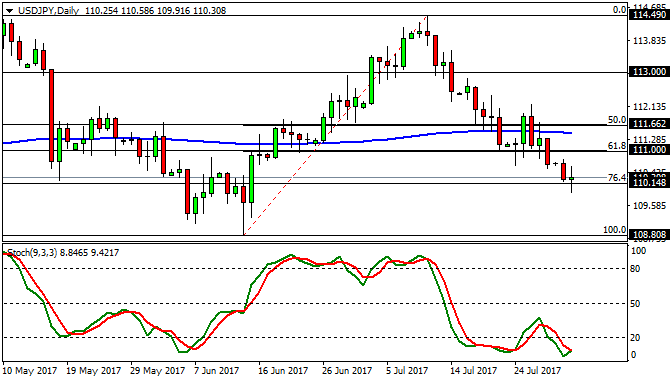 The USD/JPY pair lost its strong momentum over the last four months as its trading within 108.80 – 114.50 area. The simple moving averages 50, 100 and 200 in the daily chart are flattening. The range is getting tighter and tighter before the NFP. I recommend caution, once the news come out there will be a lot of volatility. After two successive days for the dollar, yesterday the yen fully offset losses, taking 68 pips out of the US dollar. At the beginning of the day one dollar was quoted at 110.72 yen, and at the end of the session the rate was 110.04. Extreme values ​​for the day were recorded at 109.85 and 110.82 respectively. USD/JPY is range-bound again after the rally caused by the NFP last week. Despite the range, however, the pair is still bullish and I expect another rally to 111.20. USD/JPY did move to the downside after all. I think next target is the last local low at 109.84.